Posted on Monday, March 19th, 2018 at 8:50 pm. Hello everyone! I’m Alaa Mahmoud from Egypt. I’m currently enrolled as a fourth year medical student in Suez Canal University, Egypt. In 2006, I participated in the J-1 Summer Work Travel program and attended the Council on International Educational Exchange’s (CIEE) Civic Leadership Summit 2016 (CLS16). These experiences influenced me as a person and made me a change maker. Children gathering around their tutors during different sessions during the children’s green camp. Left: English conversation skills. | Right: First aid session. After completing my J-1 program and participating in CLS16 where I had the privilege to meet 62 young leaders from all around the world, I was inspired to launch an organization concerned with environmental and public health issues. While attending the summit, I gained skills that gave me the motivation to create ExEgypt (Exchanging & Empowering Global Youth Potentials & Talents), an initiative involving young children to help create young leaders. Since I came back to Egypt, I started thinking with three of my colleagues about how to build something that would have a good impact and make a difference—not only in our community, but all over the world. Therefore, we figured out that society means everything. It’s why we started, how we achieve, and whom we’d like to affect. Our practices are directed toward every human being in the society, starting with children and ending with adults. We aim to increase green areas, raise awareness of pollution and public health, and bring to life the idea of recycling and emphasize its significance. We presented the idea to our university administrators and they completely supported us, made some suggestions, and gave us the motivation to start working on that project inside the university and in our city. Children showing their work after learning the basics of planting by ExEgypt’s professional tutors. Thankfully, many professors offered to volunteer with us and to be supervisors of the project, to make sure it went as we planned. My friends and I were completely responsible for our first green children camp and we organized it using our own money because we believed in every single step we took. After the great impact of the first camp, many people started asking about our program and how could they help us, either by donation or by volunteering themselves. One touching story is that we got a message from one of the parents thanking us for what we did with their children, and that they started becoming more independent and following a healthier lifestyle because of our camp. meet to get to know more about ExEgypt and its various activities. 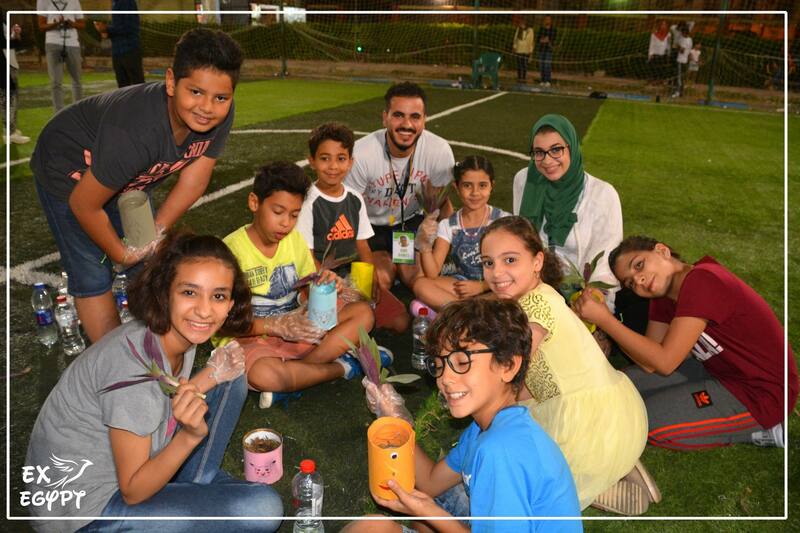 ExEgypt activities include organizing educational camps for children to increase their knowledge of fundamental topics such as healthy lifestyle, first aid, and keeping the environment clean by planting and recycling. ExEgypt encourages college students to volunteer in community services, organize camps and events, and spread awareness on topics that have a global concern and must be given attention, such as gender equality and global warming. ExEgypt also focuses on conducting workshops by professional trainers on important skills—mainly leaderships skills and how to be change makers. We also organize seasonal schools in the winter and summer for international students, conducting a scientific medical program and a social program showing them around Egypt. Check out the video of the first Children Green Camp that we organized. The event allowed kids to learn about protecting the environment in interactive and playful ways. ExEgypt aims to be the most influential association concerned with environmental issues and public health. This can be measured by seeing our impact on the upcoming generations’ behaviors. We also plan to leave a substantial fingerprint on the environment by restoring more green areas and living in a healthier environment.